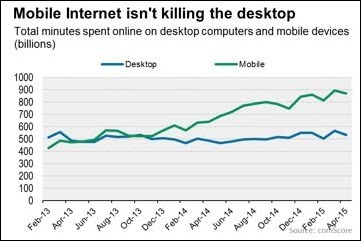 A May 26 Wall Street Journal article is headlined “Mobile Isn’t Killing the Desktop Internet.” With such an inflammatory title it’s of course one of the top trending stories. It’s not that Mr. Marshall is flat-out wrong. It’s that the title and tone of his article are, I think, misleading. e App Report.” This one looks at just the “Digital Media” category. Separately the report states that “desktop computer usage…still managed to grow by 1 percent,” a figure not inconsistent with the Wall Street Journal article. But this encompasses all desktop computer usage, the majority of which relates to the Microsoft and Adobe application suites as well as email. 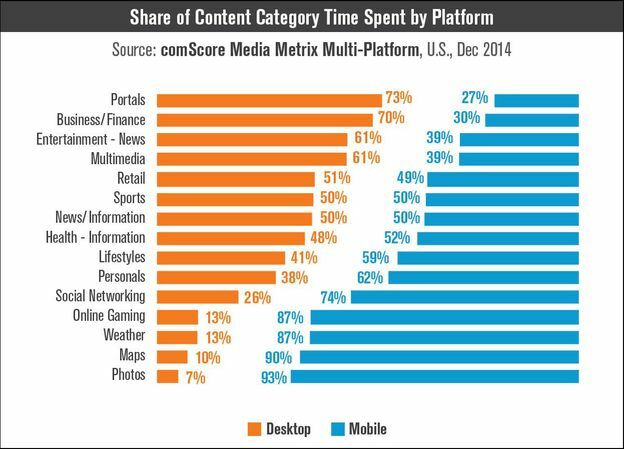 Indeed, in another comScore report, “The U.S. Digital Future in Focus 2015,” we get a look at the different ways that desktop and mobile devices are used. If we were just to considered the top five categories above then the desktop would still the dominant computing platform. 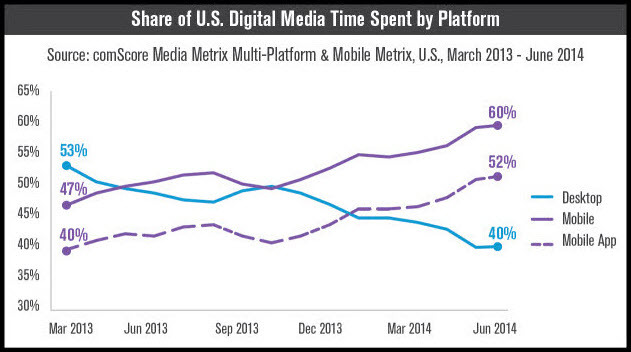 Perhaps the most revealing chart from that report is platform usage. The real story is not that the PC usage is up, but that simultaneous device use — usually called “multi-platform” — has changed the device landscape. As you can see in this chart desktop PC-only use is declining sharply in all age groups, while the use of multiple devices continues to grow sharply, notably (surprisingly?) in the 55+ age group. 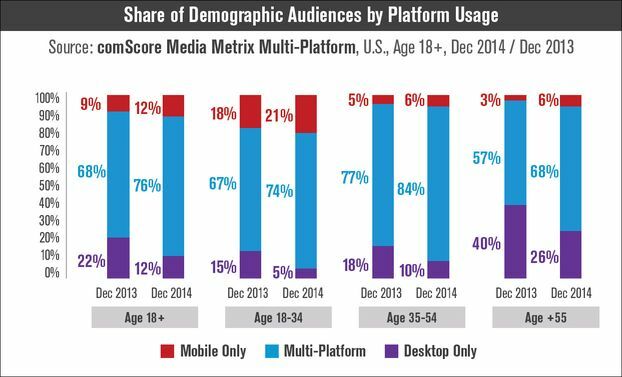 Mobile-only use is growing in all age groups, but again, by the largest percentage in the 55+ group. In the closely-watched 18-34 segment mobile-only use grew by 17% in the year to December 2014. Assuming the same rate of growth, by December 2015 nearly a quarter of this segment will be mobile-only users. I invited Jack Marshall to respond and he has been helpfully corresponding with me, further explaining his argument. @jafurtado @ThadMcIlroy i don’t understand your point. the data you cite reflect *share*, which is obviously changing. I don’t understand your rationale. You say the article is misleading, and then present data reflecting *share* of time spent, not absolute minutes. In other words, your understanding seems to reflect the myth my article was attempting to debunk. OK. I think I get the point you’re making. It does sound like we’re on different trails. I don’t think that total minutes is a more significant data point than share of minutes. Why I’m inclined to rail against your article is that I sense in it (I’m first to admit that it’s my sense/bias) an inappropriate defense for the PC. I do think that the mobile hordes overstate the supposed death of the PC. But on the other hand I have a larger fear that the guardians of the existing world order mislead when they try to downplay mobile. I’m 58-years-old. I sometimes wish that “mobile” would f- off and die. But I’m now convinced that it’s going to do anything but. And I think that most people in my broad age group (I doubt you are so old) are still in denial. I didn’t say one is more significant than the other. Simply that there’s no real evidence that the desktop is actually in decline. Honestly, I think you’ve misunderstood the data and the article, and that your piece is inaccurate and you may want to consider updating it. I can’t quite decide who’s got this one pinned down. I’ll leave it up to you, dear reader.